Stock markets rose again this month and our net worth went over the AUD 2 million mark. I am wondering how sustainable that is going to turn out to be. We hit the AUD 1 million mark in September 2013. So it's only taken just over 4 years to add another million and double our net worth. "Current other income" was $21k. This was a three salary payments month and I also got a large reimbursement. Spending (not counting our mortgage) was high at $8.5k. 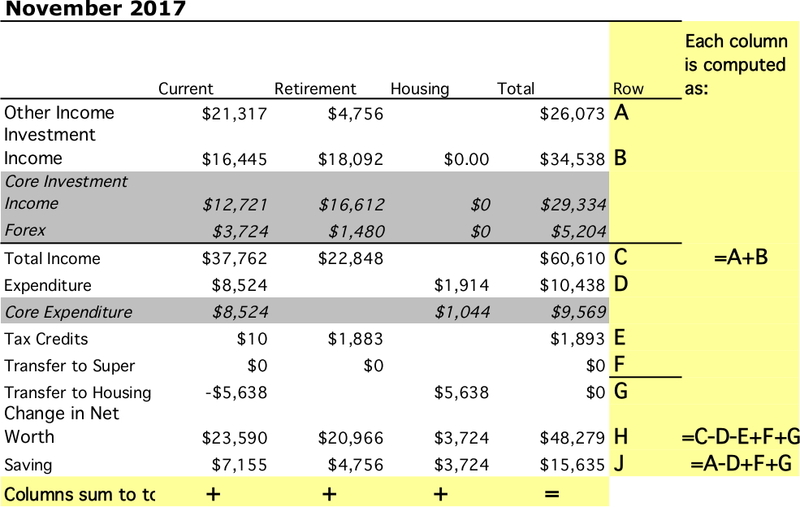 After deducting the mortgage payment of $5.6k (which includes implicit interest saving due to our offset account - the actual mortgage payment was about $869 less than this - it was also a three mortgage payment month), we saved $7.1k on the current account and added $3.7k in housing equity. 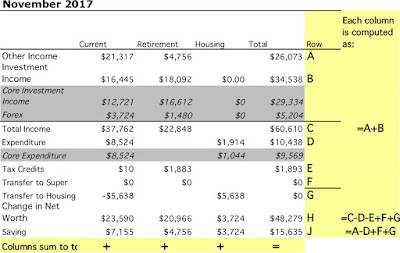 Retirement contributions were $4.7k. Net saving was, therefore, $15.6k across the board. The Australian Dollar fell slightly from USD 0.7672 to USD 0.7571. The ASX 200 gained 1.64%, the MSCI World Index gained 1.98%, and the S&P 500 3.07%. All these are total returns including dividends. We gained 1.98% in Australian Dollar terms and 1.68% in US Dollar terms. So, we slightly outperformed the Australian market and slightly underperformed international markets. The best performer in dollar terms was the Colonial First State Geared Share Fund, gaining $5.9k followed by Unisuper, PSSAP, and Platinum Capital, which all gained around $4k. 3i (III.L) was the worst performer losing $0.8k. Hedge funds were the best performing asset class in percentage terms, gaining 2.43%. Private equity was the worst performing asset class, losing 0.47%. As a result of all this, net worth rose AUD 48k to $2.034 million or rose USD 17k to USD 1.54 million. How Did We Get to AUD 2 Million?